stickboybike: 2009 Bianchi SOK follow up/comparison. 2009 Bianchi SOK follow up/comparison. As most people know, Bianchi Bicycles is a manufacturer of bicycles for cyclist without compromise. Our commuter and road line of products are very strong, well spec'd and beyond the quality of a lot of the top brands out there. One secret weapon is our 2009 Bianchi SOK SRAM bike. This 29er is definitely winning the hearts of mountain bikers that give it a chance. Give it a chance as in, more than just a test ride in the parking lot of your LBS. Trail time; half dozen or so rides to learn a new dance with a new partner. In fact most 29ers require just that, some trail time to get used to. I can say that I've ridden every demographic of knobby tire pedaling transportation out there and the 29er takes a bit more time to adjust to than most typical 26in bikes, hardtail or dually. You need to be committed to the end result of this learning curve, a fast ride. Too many people get hung up on studying the geometry of a prospected 29er frame before even riding it. Naturally I'm partial to my brand and the big wheeled version that we produce but here is why I enjoy my take of the Italian brands wagon wheeler over others. And again, these opinions may not be digested by others the same way, they are just my personal bullet points that make this bike a blast. I'm lightly comparing it to the Niner A.I.R.9- 21in frame size. The chainstay is 10mm longer than a Niner A.I.R.9- 450mm vs 440mm. Not saying that the 9 has too short of a chainstay but combined with the 71 degree headtube angle of the SOK, climbing traction is enhanced. You ever see motorcycle hill climbs and the swingarm length those guys are rolling with? SOK seat tube angle of 74 degree vs. 73 degree on the A.I.R.9. One of the major complaints of a 29er is that they steer too slow. Yes, there will be a different steering rate on a 29er than a 26 inch hardtail mountain bike but if you look at the other 29er frame geometries, they have a slacker seat tube angle matched with a longer Front to Center dimension which will provide a rear biased weight/sitting position matched with more front end to muscle around the corners. The 'one degree steeper' seat tube will do one of two things for the cyclist on the SOK. 2- On climbs, especially on the East Coast/Mid-Atlantic region, you're either going up or down. So when the terrain goes up, you'll have a seat post angle that potentially won't put you too much over the back of the bike causing you to fight to keep the front wheel glued to terrafirma, just the right amount forward. The SOK bottom bracket height drop is 50mm vs. 60mm on the A.I.R.9. With a larger quantity of logs and rocks on the Mid-Atlantic trails, the 10mm higher bottom bracket will provide better clearance thought the technical sections. 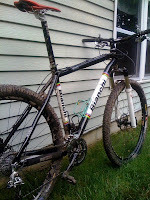 So there's the quick and somewhat dirty how and why on the 2009 SOK 29er. Now go outside and ride!